Our 18-page Guide + Recipe Book is a great natural thyroid, autoimmune & resting metabolism restoration starter kit of actionable nutrition & lifestyle tips, skills-building & recipes you can begin quickly & easily to nourish your best wellness and thyroid weight loss today. All our e3 Energy Evolved original recipes included for you combine natural thyroid health & fat loss nutritional properties in amazingly tasty, easy to make food pairings, and they’re sugar-free, soy-free, dairy-free, gluten-free, chemical-free. Let self-healing experienced Diagnostic & Functional Nutritionists do the work for you instead of trying to figure it all out yourself! We take the food stress & obsession out your way so you can just de-stress & focus your mind on restoring your health, enjoying your food, and feeling, looking & living better (no heavy-nutrition-lifting required to figure it all out!). 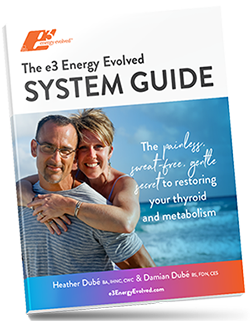 In our guide, we also give you a sneak-peek into our very-own e3 Energy Evolved System that we used to heal my thyroid, adrenals & metabolism drug-free & synthetic-free from advanced Hashimoto’s thyroiditis, chronic fatigue syndrome, auto immune illness, candida, pancreas toxicity & partial Lupus & return to naturally compete as a US national level NPC figure athlete in just 2 yrs time. YOUR BODY has a deep desire to be well & function in balance for you (no matter what anyone has told you). You’ll also receive our “Energy Source” Newsletter when you download your free copy of our e3 Energy Evolved System Guide by entering your contact information below.